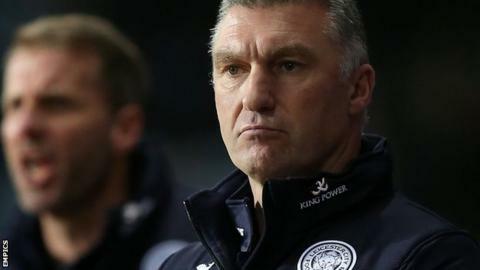 Nigel Pearson says he could have lost his job as Leicester City manager had performances been "very, very bad". The Foxes are bottom of the Premier League, without a win in 12 matches since September's 5-3 victory against Manchester United at the King Power. Director of football Terry Robinson lost his job earlier this month. "If I was sitting here in the knowledge our performances were very, very bad, I wouldn't be sitting here for a start," Pearson said. Pearson returned for a second spell in charge of Leicester in November 2011. Having led the club into the Premier League after a 10-year absence with the Championship title last term, the former Hull City and Southampton boss has been given time to turn form around. However, a recent incident with a supporter, culminating in a £10,000 fine and a touchline ban from the Football Association, suggested frustrations from sections of the club's support. Tottenham Hotspur provide the opposition on Boxing Day, and an opportunity for the league's bottom side to end their winless streak. "What would be a success for us would be to get the elusive win. This period throws up a lot of fixtures in a short period of time," added Pearson. "We'll be doing everything we can to change our fortunes on Boxing Day first and foremost."